Eric Swanson from the University of Pittsburgh gives his viewpoint on two new experiments have detected the signature of a new subatomic particle, Zc(3900). Particle physicists seem to have a pretty good handle on the fundamental particles of the universe, but there are some glaring holes in this understanding. Quarks are a good example of this. We know that all nuclear matter is made up of quarks, and we have a pretty good understanding of how two quarks interact at close range. But our quark theory cannot tell us which quark combinations will result in a bound particle or a stable nuclei. All we can go on is experience, and experience has shown that particles with four quarks do not exist. But the situation may have changed with the possible discovery of a new particle containing at least four quarks. Two separate groups, both reporting in Physical Review Letters, have seen evidence for this strange particle, called Zc(3900). Although the data is open to other interpretations, it’s clear that our understanding of quarks has a long way to go. The evidence for Zc(3900) comes from two independent groups: the BESIII Collaboration at the Beijing Electron Positron Collider, China,  and the Belle Collaboration at the High Energy Accelerator Research Organization in Tsukuba, Japan . It is the business of both labs to accelerate electrons and positrons to nearly the speed of light, smashing them into each other and carefully analyzing the resulting debris. Taken together, the two collaborations have uncovered 466 events that appear to have a Zc(3900) in their debris. In the ethereal world of high-energy physics, it is easy to forget that subatomic particles are quite real: they smack into things, betray their presence in photographic emulsion, leave tiny contrails in bubble chambers, set off showers of electrons in gases, and emit cones of light in liquids. Experimentalists have created detectors that leverage all of these subatomic signatures in a single, house-sized assembly. The Belle and BESIII collaborations are each named after the detectors that the scientists have labored so long to build. Previous particle physics detectors have given us a fairly detailed picture of the interior of atoms. We know that an atom consists of electrons in orbitals and a core nucleus. Nuclei are built of protons and neutrons, and protons and neutrons are built of quarks. Quarks come in six varieties that can stick together to make an infinite array of particles called hadrons (protons and neutrons are two of these). The theory that describes the interactions of quarks is called quantum chromodynamics (QCD) and is part of our current theory of everything, called the standard model. At high energies, QCD is relatively simple to understand and its predictions have been confirmed many times over. However, it is vexingly difficult to make predictions with QCD at lower energies, where quarks bind together into particles. Thus we cannot unambiguously say which quark configurations are allowed and which are not. This irony (of having the pieces but not the manual to put them together) makes it especially important to explore the panoply of hadrons in experiments such as BESIII and Belle. Seventy years of experimental effort has revealed that quarks tend to cluster in quark-antiquark pairs called mesons [see Fig. 1(a)], triplets of quarks called baryons [Fig. 1(b)], and groups of quark triplets, which are the atomic nuclei. But recently, evidence has begun to accumulate that other, more exotic combinations are possible . One such oddity, called the Y(4260), was discovered in 2005 . To appreciate the wackiness of this particle we must delve into the force that causes interactions between the quarks. Just as two electric charges exert an electromagnetic force on each other through the sharing of photons, quarks are attracted to each other through the sharing of particles called (rather unimaginatively) gluons. Unlike photons, gluons can interact strongly with each other, which can lead to strange combinations not seen in the electromagnetic sector. The Y(4260) is one such example, as it appears to be made of a charm quark, an anticharm quark, and an extra gluon. This gluon is not one of the shared gluons but would be a “permanent” member like the quarks. Theorists have even taken this gluon permanence one step further with a hypothetical particle called a “glueball” that would be all gluons, no quarks—like an atom of pure light. It was in seeking to clarify the nature of the enigmatic Y(4260) that BESIII and Belle discovered another enigma, the Zc(3900) [1, 2]. Both groups were making Y(4260) by colliding beams of electrons and positrons, and studying the debris that emerges when the Y decays (the Y only lives for about 10−23 seconds). Much of the time, the debris consists of a positive pion (π+), a negative pion (π−), and a J/Ψ particle. Pions are mesons consisting of up and down quarks and antiquarks, while the J/Ψ is a neutral meson made of a charm-anticharm quark pair. But the events with the pions and J/Ψ contained a surprise in how the energy was distributed between the three particles. The implication is that the decay goes through an intermediate particle, the Zc, which is about 4 times heavier than a proton (3900 mega-electron-volts) and decays to a charged pion and a J/Ψ. The large mass of the Zc and its decay to J/Ψ implies that it most likely contains charm and anticharm quarks, but this by itself would be a neutral combination, which would violate electric charge conservation. The nonzero net charge of the decay products implies that Zc must be a charged particle (either positive or negative, depending on the charge of the pion). Therefore, the Zc must contain other quarks—besides charm and anticharm—that can give the appropriate charge . One such combination is shown in Fig 1(c), but other four-quark combinations are possible as well. Bound states like this have never been observed before, so many in the particle physics community have been left scratching their heads. Alternative explanations of the data exist that are based on less exotic quark-based interactions. One possibility is that the Zc is not a new particle but is an interaction between two D mesons. These D mesons are a combination of a charm quark with an up or down quark, so they give essentially the same quark content as in Fig. 1(c). Some models predict that these mesons will be attracted to each other with sufficient strength to explain the data. The difference between this D meson interaction and a new four-quark particle is only a matter of degree, but future experiments studying how the D mesons interact might be able to settle the issue. From the theory side, continued efforts at solving QCD might reveal whether four or more quarks can naturally come together to form a particle. If the four-quark explanation is confirmed, our particle physics zoo will need to be enlarged to include new species. And our understanding of quark taxonomy will have expanded into a new realm. M. Ablikim et al. (BESIII Collaboration), “Observation of a Charged Charmoniumlike Structure in e+e−→π+π−J/ψ at s√=4.26 GeV,” Phys. Rev. Lett. 110, 252001 (2013). Z. Q. Liu et al. (Belle Collaboration), “Study of e+e−→π+π−J/ψ and Observation of a Charged Charmoniumlike State at Belle,” Phys. Rev. Lett. 110, 252002 (2013). T. Barnes, S. Godfrey, and E. S. Swanson,“Higher Charmonia,” Phys. Rev. D 72, 054026 (2005); E. S. Swanson, “The New Heavy Mesons: A Status Report,” Phys. Rep. 429, 243 (2006). 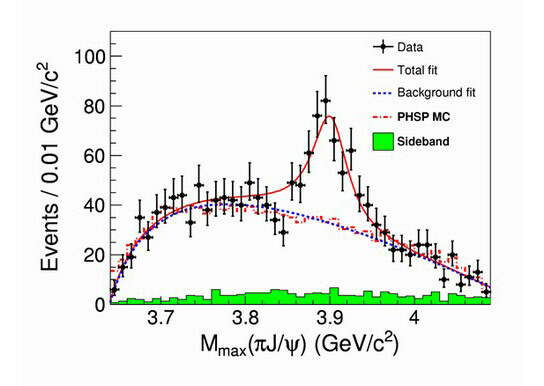 B. Aubert et al., “Observation of a Broad Structure in the π+π− J/ψ Mass Spectrum around 4.26 GeV/c2,” Phys. Rev. Lett. 95, 142001 (2005). There are other hints of charged two-quark plus two-antiquark combinations. See A. Bondar et al. (Belle Collaboration), “Observation of Two Charged Bottomoniumlike Resonances in Y(5S) Decays,” Phys. Rev. Lett. 108, 122001 (2012); S.-K. Choi et al. (Belle Collaboration), “Observation of a Resonancelike Structure in the π+−ψ′ Mass Distribution in Exclusive B→Kπ+−ψ′ Decays,” 100, 142001 (2008). Be the first to comment on "New Subatomic Particle Zc(3900) Hints at Four-Quark Matter"